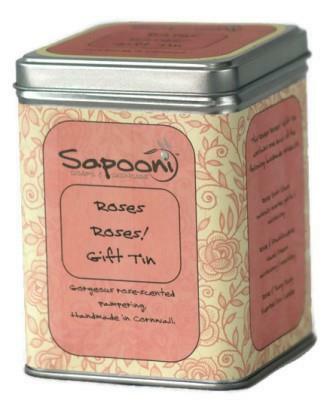 Our Roses Roses Gift Tin is an elegant aluminium gift tin, filled with a selection of rose-inspired handmade skincare. Pamper a special lady for Mother’s Day, birthday, anniversary, wedding or special occasion- or just for the fun of giving. What’s in the Roses Gift Tin? 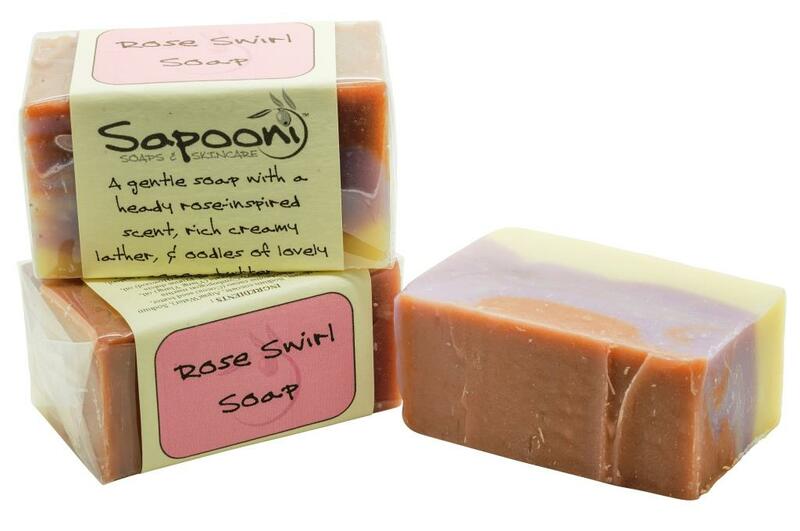 Rose Swirl Soap; A natural, handmade soap delicately scented with essential oils. It’s scent is inspired by the heady, musky sweetness of dew-soaked summer roses. As with all our handmade soaps, it has a rich creamy lather and skin-loving ingredients. Definitely one for the girls, prettily swirled with rosy pink, pale pink and ivory. 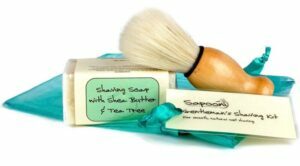 Soap bar is 100g e.
Cocoa butter; A wonderfully rich moisturiser, especially good for dry skin. 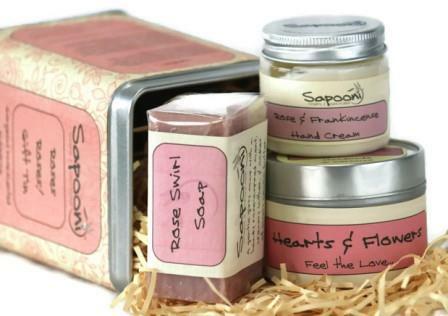 French red clay; A natural exfoliate to gently cleanse the skin, and create the lovely rose pink swirls. 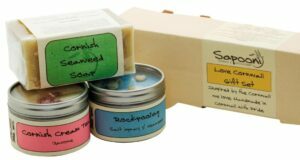 Natural essential oils; We use our own special blend, containing Palmerosa, Ylang Ylang, Howood and Patchouli to produce a scent which is sweet, heady, musky and sensual. 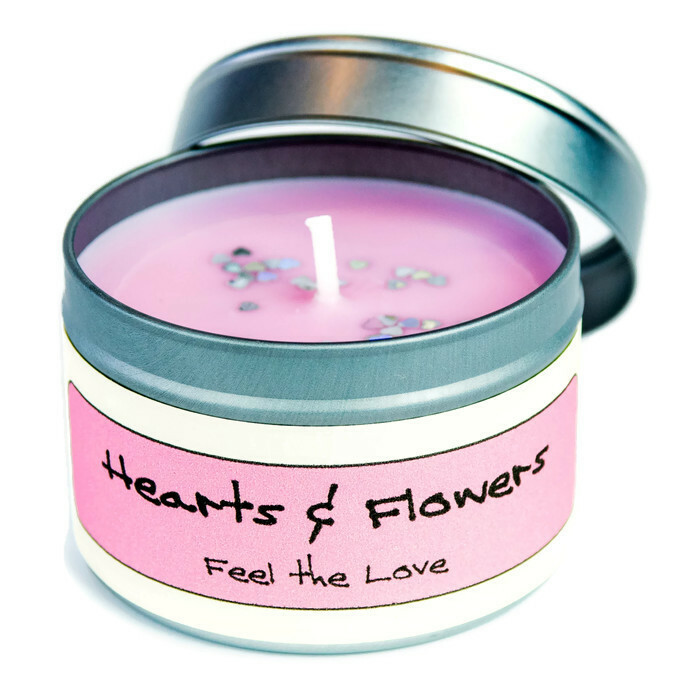 Hearts and Flowers Soy candle; Unashamedly pink and girly, scented with a heady Rose and Ylang Ylang fragrance, and coloured a pretty pastel pink, topped with tiny glittery hearts. Made with natural soy wax, with a cotton braided wick, this candle will burn for a minimum of 20 hours. Rose and Frankincense Hand Cream; Based on organic Sea Buckthorn oil and Shea Butter, our rose and Frankincense Hand Cream is rich yet easily absorbed, and doesn’t leave a greasy residue on your hands. Scented with 100% natural essential oils, including a wonderful Rose absolute – reputed to have a rejuvenating and healing effect on the skin, with anti-inflammatory properties. 60g e jar. 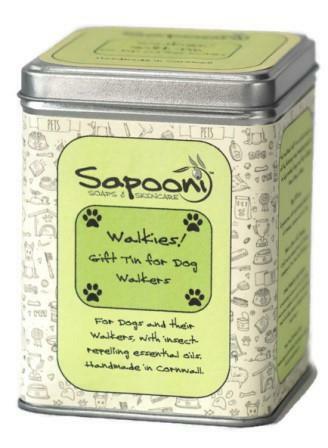 The empty gift tin can be re-used as a handy storage tin. A lovely gift tin, bought for mum and everything smells gorgeous.